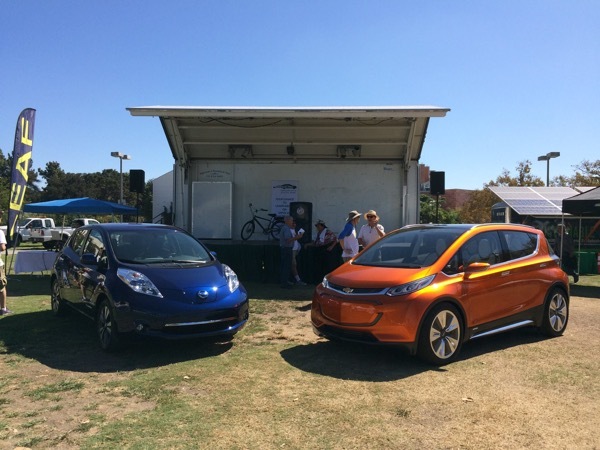 The LA NDEW event had over 1,000 people, who test drove the latest PEVs from Audi, BMW, Chevy, Fiat, Ford, Kia, Mercedes Benz, Nissan, Pedego, and VIA Motors. Our event marked the West Coast debut of the Chevy Bolt EV Concept car that gets 200 miles range, will be price in the low $30K range and will be on sale fall 2016. We also witnessed the debut of the 2016 Nissan Leaf, which boasts a 20% increase in range and is available for purchase this fall. LAPD displayed their electrified fleet that includes a black and white Tesla S, BMW i8, and Zero Motorcycle pursuit vehicles. The crowd was standing with Senator Kevin de León in his leadership toward a clean energy future for ALL Californians. Leilani Munter brought the tricked out Tesla S featured in the movie #RacingExtinction, and encouraged everyone to #pickonething to combat climate change. Check it out on Discovery Channel November 2015. Come test drive all the latest plug-in vehicles from Audi, BMW, Chevrolet, Fiat, Kia, Mercedes-Benz, Nissan, and Volkswagen. 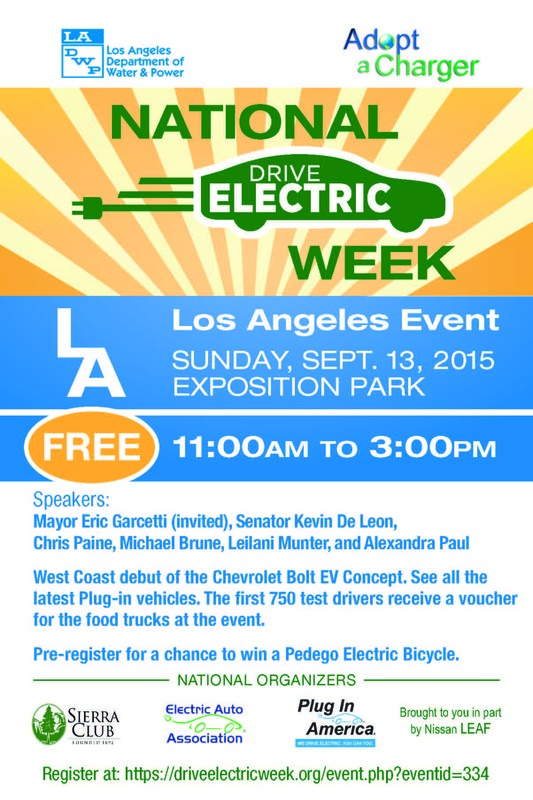 This event will be the West Coast debut of the Chevy Bolt Concept Car. The first 750 attendees will receive a souvenir t-shirt and the first 750 people to take a test drive/ride will receive a free meal from one of the food trucks at our event: Border Grill, Cool Haus, or The Green Truck. Pre-register for your chance to win a Pedego Electric Bicycle valued at $3,000 (winner must be present to claim prize). Los Angeles is leading the way with zero emission vehicles and cleaner air for all. 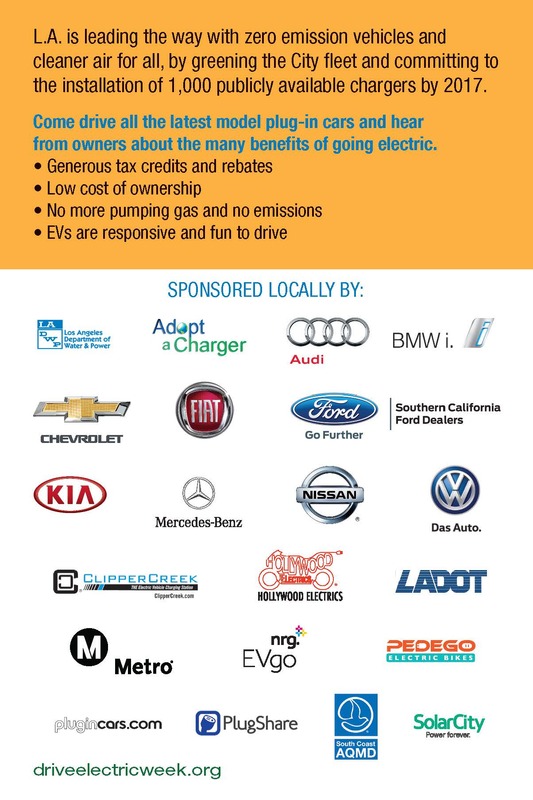 Hear from actual owners about the many benefits of going electric. There are currently 1223 attendees registered. Registered attendees report 4,860,505 electric miles driven.